Tom and I after dinner on his birthday when my clothes were dirty from my flying lobster tail landing in my lap. Yesterday, I finished packing except for a few toiletries we'll need today and tomorrow morning. Tom has waited to pack until today but all of his clothes are neatly folded, button shirts plastic wrapped and stacked on the extra bed in his clothing bedroom. Gee...its been nice for each of us to have one extra bedroom to store our clothing making packing all the easier and more convenient. We've rarely made extra bedrooms a criteria in selecting vacation homes. If they have more than one bedroom, great. If not, we carry on. 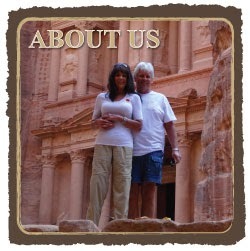 When we originally planned our travels in 2012, we'd expected family and friends would visit from time to time. This hasn't occurred much when we've been too far away in most cases. Tom's sisters and brothers-in-law visited us early on in our travels in the vacation home in Henderson, Nevada, our kids and grandchildren visited the Big Island and my sister visited Kauai this past March. A few other visitor possibilities have arisen but unfortunately, we didn't have enough space at the time. Making three bedrooms or more a criteria would greatly reduce the opportunity to visit certain countries when prices for vacation homes may be higher in some locations due to demand with an overall higher cost of living. We spent time with the honeymoon couple, Samantha and Danny at dinner. This photo was taken by our taxi driver after a dinner out at the Arts Village. As a result, we'd chosen location and price as our top priorities, number of bedrooms as a matter of convenience not a necessity. Since we plan almost two years out, if family or friends would like to visit, we'll always know well in advance what's booked in the future and if it will work. This Pacific Harbour house has actually been one of our favorite houses as far as houses go, although we haven't had a view other than exquisite vegetation which has been fine. The private pool has compensated for a lack of oceanview. On a few occasions, we've had both with more yet to come. Anyway, on to this and that...many months ago when we lived in Trinity Beach Australia,, we were contacted by a couple from the US, around our ages, who planned to travel the world for two years to then settle down. They'd asked lots of questions as to the feasibility and the particulars and we were happy to offer suggestions. Tom had met them online at the popular cruisecritic.com and, we'll be on the same cruise in two days, departing from Sydney. Its not unusual to meet other passengers on cruisecritic.com well in advance of the cruise with plans to meet in person once onboard the ship. At this point, we have three such meetings planned for this cruise, two separate groups for private excursions for six, a planned dinner and of course, the couple traveling the world for two years who's cabin in on our same deck. Tom, on the night of his birthday for a fabulous dinner at the Pearl's gourmet restaurant, Seduce, definitely deserved a five star review. As we chatted back and forth with Doreen over a week via email we realizing writing was taking too much time, we decided to speak on Skype which worked much better. We covered a lot of ground. Our site has tons of information on the "how to" of world travel from we've learned over these past four years on continuing research. But, with over 1250 posts to date, searching through our archives for each entry is time consuming, especially for the less experience web users. We're always happy to assist in any way we can. Of course, after these 39 months of travel we still have a lot to learn but feel we have a handle on many areas of concern. Last night, I heard from Doreen once again after a few month's hiatus to hear they've been enjoying living in an apartment in Sydney and are busy packing for the cruise. We made a loose plan to meet in person at the first organized cruisecritic.com party which most likely will be held within 24 hours of boarding the ship. A notice will be posted in our cabin as to the dates and times of parties. Its from these events (as well as simply sitting about the ship) we usually have an opportunity to meet many other travelers, some on vacation/holiday only and others who travel frequently. This photo is so me...lots of disgusting looking seafood which I find delectable. As times we hear of others who've sold everything, as we have and are traveling permanently like us, but we've yet to meet anyone as yet who have no home base. We've met many couples and individuals who've been traveling long term or to many locations over a period of years with a home base they return to from time to time. However, we often find tremendous enjoyment in meeting others who may not travel more frequently than once or twice a year or less. After all, there's more to us and to them than travel. All of us have a diverse range of interests that has nothing to do with where we live or where we visit, providing many opportunities for engaging conversation and commonality. Tonight, we've decided to dine in having "breakfast" for dinner using our remaining eggs, cheese, fresh mushrooms, onion and tomatoes. Mainly, we're motivated to dine in more due to the fact that we didn't want to wear anything that may need washing other than the few casual items we're wearing today, than in using any leftover items. Leaving tomorrow (Monday) at 7:45 am, and with rain today there's no further opportunity for another load of laundry. Yesterday, with the sun out off and on, we managed a bit of pool and chaise lounge time. We both have a little tan base which will enable us to spend 40 minutes a day at the ship's outdoor pool without the necessity of sunscreen. (From considerable research over these years, we've discovered that the use of sunscreen prevents the absorption of Vitamin D. Only about 20 minutes on each side should be a small enough dose of sun to reduce the risks of skin cancer and yet add an excellent dose of the vital vitamin. More sun exposure may be risky, especially for fair skinned individuals such as Tom). This photo from Christmas Day at the Pearl is so "Tom," who loves good meat and sweets. Thanks to all of our readers for continuing to share in our ongoing journey over this past year when we've stayed in locations for longer periods than we may in the future; eight months in Hawaii and four months in Fiji. During these longer stays we've come to realize that future bookings will most likely not include four months in one location, except for one. The only country where we'll live for four months is upcoming in Bali beginning in April when we'll live in the same property two times, two months each, with a two month break in between, all due to visa restrictions. The property was irresistible, affordable with the ocean and a pool and breaking it up into two segments should work well for us. More on that later. After tomorrow's post which will automatically upload while on our way to the Nausori Airport in Suva, which includes all of our expenses for both islands and a grand total for the four months we've spent in Fiji. The next morning you'll see a post about our one day stay in a hotel in Sydney with a few photos. From there, posts will be aboard ship and on the excursions we've planned. Happy day after the New Year's celebrations and may those still working, may you have an easy and painless entry into the new year when heading back at work. This sign served as a valuable warning to keep us and others from exploring beyond this point when we visited Lava Tree Park one year ago. For more details, please click here.